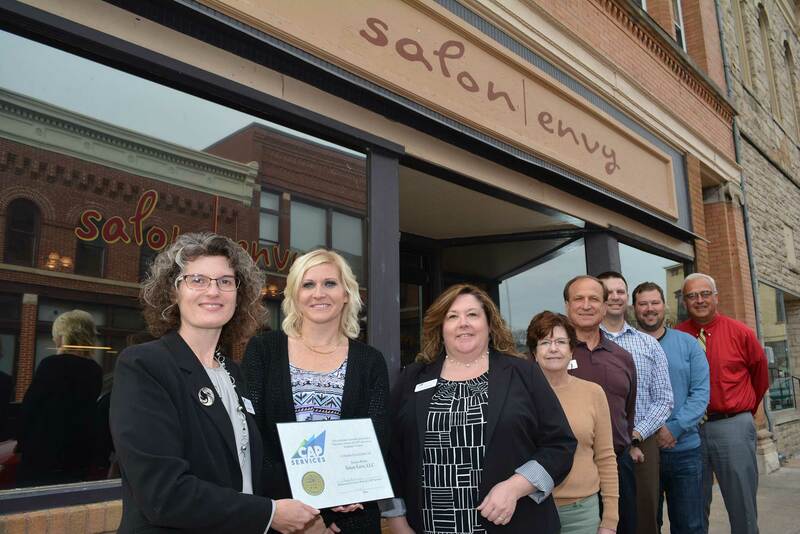 Salon Envy wins CAP Services’ Business Expansion Contest – CAP Services Inc.
From left, CAP Services’ Laura West presents Salon Envy owner Jessica Richie with a certificate recognizing her business as the winner of CAP’s Business Expansion Contest. They are joined by CAP’s Kitty Johnson and Dawn Thrun; Fox Valley Technical College’s Business & Industry Services Director Dale Walker; Fox Cities Regional Partnership’s Director of Existing Industry Rob Peterson; Sweeney Law’s Associate Attorney Hans R. Thompson; and Portage County Business Council Executive Director Todd Kuckkahn. 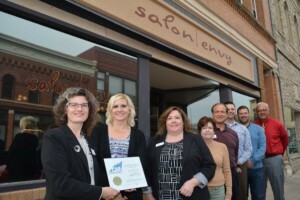 CAP Services recently named Salon Envy of Stevens Point the winner of CAP’s 2nd Annual Business Expansion Contest. Salon Envy was established in 2008. Its professional stylists provide salon services including color, cut, updos, waxing and nail art. Salon Envy will receive a $1,000 cash prize as well as a variety of free services from contest partners including one year of business technical assistance, a marketing assessment, “StrengthsFinder 2.0” and “Strengths Base Leadership” training materials, enrollment in the ‘Marketing Made Lean’ course at Fox Valley Technical College, business legal consulting with Hans Thompson from Sweeney Law Office S.C., a one-year membership to the Portage County Business Council, mentorship through the Packers Mentor-Protégé Program, and referrals to services specific to the business’s needs. Contest supporters and partners included Calumet County Economic Development Corporation, Fox Cities Chamber of Commerce, Fox Cities Regional Partnership, Fox Valley Technical College, Green Bay Packers Mentor-Protégé Program, New London Area Chamber of Commerce, Portage County Business Council, Sweeney Law Office S.C., UW-Oshkosh Small Business Development Center, Waupaca Area Chamber of Commerce and Waupaca County Economic Development Corporation. A panel of five judges with economic development expertise selected Salon Envy based on content and presentation of business expansion plans. Any business within the eight county region that CAP’s Business Development Program serves – Calumet, Marathon, Marquette, Outagamie, Portage, Waupaca, Waushara, and Wood – operating their business for two years or more with plans to expand their sales footprint was eligible to apply. CAP Services’ business development program provides services to start-up and expanding businesses, including business plan development, financial analysis and finance packaging that can include working capital and gap financing, marketing plans and one-on-one technical assistance. The services are provided free to low-income entrepreneurs or to businesses that create living wage jobs for low-income individuals. Since 1997, the program has helped 311 businesses start or expand, resulting in the creation of 599 living-wage jobs. In the past five years, CAP supported the development of 64 new businesses that resulted in the creation of 96 living-wage jobs in central and eastern Wisconsin. CAP Services, Inc. is a private, nonprofit community action agency that has been advancing social and economic justice for people and communities in Marquette, Outagamie, Portage, Waupaca and Waushara counties since 1966. For more information, visit capservices.org.